Amara has been taking art classes for a couple of years now. One of the things the instructor has them do is copy the Masters. 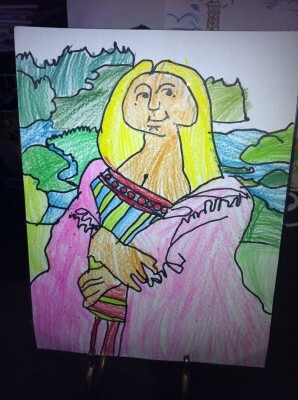 This is Amara’s interpretation of the Mona Lisa. I think it kind of looks like her! This memory was posted in Wordless Wednesday and tagged Amara, art, Wordless Wednesday on September 14, 2011 by Grandma Kc. I love her drawings! She sees so many little details that I know I would miss! She definitely has a natural talent. I love it! What a wonderful expression through art. The details in her work are just amazing! She is talented! Thanks for sharing! Amara has good proportion on her page. Nice eye for color! Thanks for sharing. Fabulous! This one really needs to be framed. I, too, have a granddaughter who’s an amazing artist. The past two years she has created Christmas cards for me. You should try that with Amara. You can have them printed the same places that print photo cards. That is an awesome idea! We have always done photo cards of the 3 of us but this might be even better! I will have to discuss this with Grampy and Amara! Have a great weekend! I’m impressed! I would have known exactly who it was without even a hint. Amara did a fantastic job on this! True artistry here. 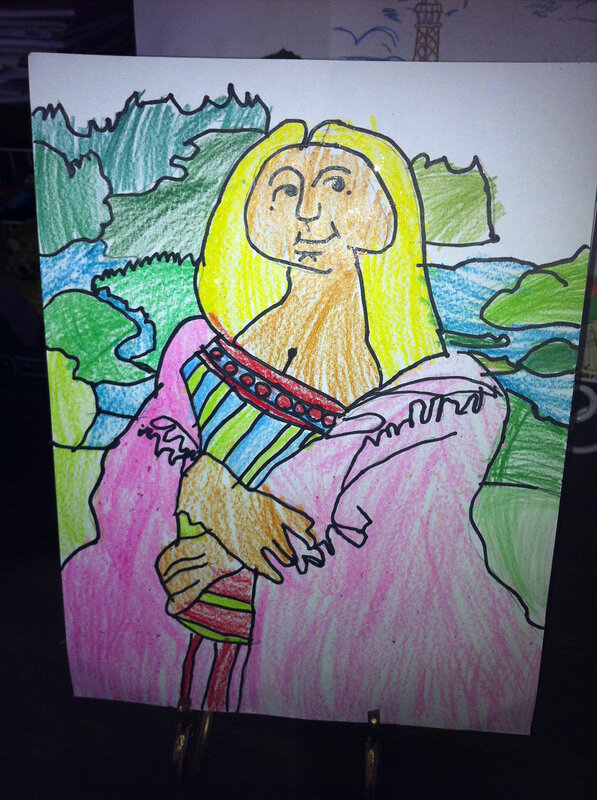 I think she has the Mona Lisa beat, though, with that obvious smile. Of course, Amara beats anyone and everyone hands down with her own REAL smile. Lovely! Wow! That is really good for a child of her age! The composition is really nicely balanced. But do I think it looks like her? Well….after seeing that pretty face that can light up a room with one smile, let’s just say it might take more than this for me! Amara has so many talents in so many areas. Of course, she has a family who has invested so much in her success, and the results are so obvious. Art lessons are wonderful for a child to have! I love this! What a great idea to copy the Masters. My 7 yo grandson recently asked if he could borrow my book about Picasso to take to school. “You know I have a book about Picasso? !” “Yes, it’s right next to the one about Kandinsky.” Blow me over. He’s right. Oh my that is very good! I love it and your title of this post 😉 I do think it looks like Amara; especially that little smile and glance to the side! I wonder what she is thinking up now! Love it!